Undoubtedly in a critical minority, Gershwin is seen as one of the great Modern composers – certainly one of the greatest American composers. He’s had a tough road to critical acceptance. You can spread the condescension toward him from the serious writers thick on a bagel. Other than a prejudice toward pop styles and pop acceptance, its hard to see why they take the attitude. A few heavyweights (Copland, Thomson, and Bernstein) and a whole bunch of lightweights blackball him from the True Composing Fraternity. But we can say this: no music like Gershwin’s existed before him, and no music in his style of comparable quality has appeared after him. Gershwin first made contact with bandleader Paul Whiteman, erroneously known as “The King of Jazz.” Whiteman fronted a dance band whose music, grandiloquently puffed as “symphonic jazz” and in reality “sweet jazz” at best, was nevertheless the most popular in the USA. Whiteman had a great influence on the future of American popular music, promoting or discovering not only Gershwin but Bix Beiderbecke, Mildred Bailey, Frankie Trumbauer, Jack Teagarden, Billie Holiday, and, spectacularly, Bing Crosby. Because of his success, he had the pick of publishers’ catalogues and of arrangers. At various times, he used Grofé. A curiosity: the Harmonie Ensemble records two versions of “Yankee Doodle Blues,” an early Gershwin and one of his rare songs to lean obviously on the blues. The first version gets all the great engineering Harmonia Mundi can muster. The second was recorded acoustically, ie, into a giant horn. At least 80% of the texture and tone disappears behind the “historical” curtain. This album scores a coup by featuring then-93-year-old Al Gallodoro, a former Whiteman reed man. Sadly, Gallodoro died before the album’s release. Nevertheless, the document is a valuable one. Gallodoro gets to duet on Gershwin’s “Summertime” with pianist Lincoln Mayorga. 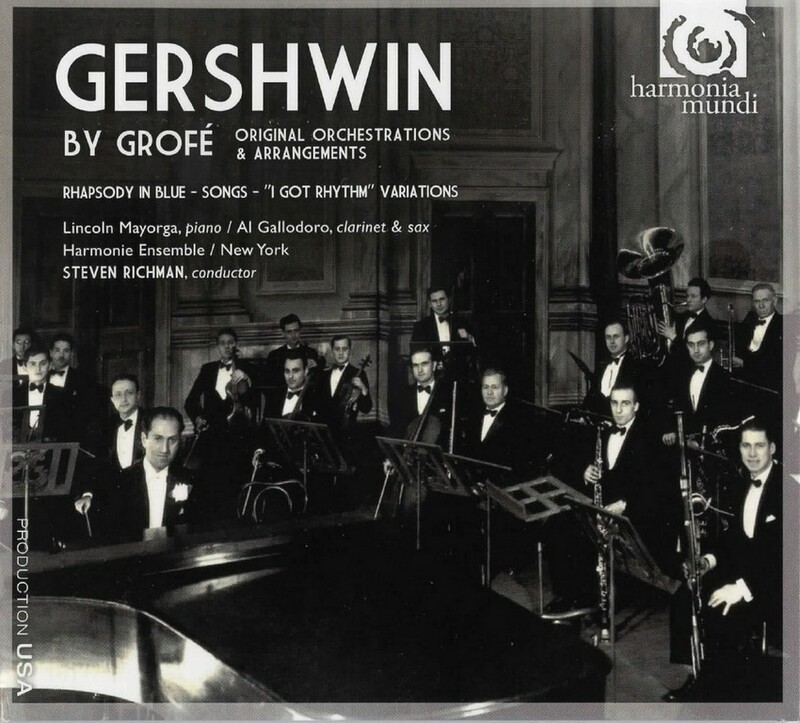 Grofé’s most famous Gershwin arrangement are, of course, the original dance band and later symphonic arrangements of Gershwin’s Rhapsody in Blue. In the throes of tryouts for a Broadway show, Gershwin had forgotten his commitment to Whiteman to provide a “jazz concerto” for Whiteman’s “Experiment in Modern Music” concert. Brother Ira saw a notice in the newspaper and alerted Brother George. With a three-week deadline, Gershwin had no time to orchestrate. He handed off pages to Grofé as he finished them. Even so, at the premiere, Gershwin had to improvise large parts of the score featuring solo piano. However, this specific set of circumstances led to unintended consequences. Rhapsody in Blue remains the only one of Gershwin’s concert works that the composer did not orchestrate, but from this arose the myth that Gershwin couldn’t orchestrate. Even Gershwin’s own publishers have not used the composer’s own scoring. Fortunately, Gershwin scholarship has come a long way toward establishing true texts, and labels have begun to record the real thing. 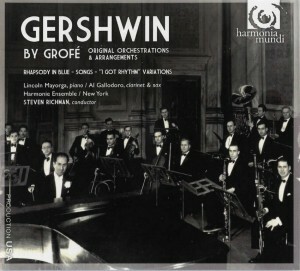 This album features Gershwin’s original score to the “I Got Rhythm” Variations. The invention in the variations both impresses and surprises. From a vigorous piano statement of the theme, we get, among other things, a section where, in the composer’s words, “the left hand doesn’t know what the right hand is doing,” a “Chinese flute” variation where the piano imitates two out-of-tune flutes, a bluesy saunter, and a socko finish. One falls in love easily with (and hard for) this music. It gets inside you, especially into your feet. If you don’t tap your tootsies, check your pulse. The dance-band items are wonderful. The Whiteman band guys would have dropped their jaws at how well Richman and the Harmonie Ensemble do. The banjo player, Scott Kuney, tears off crisp roulades of strums in eerily perfect time. He becomes one of the driving rhythmic forces of the band. But he’s not alone. Trumpets and violins in particular stand out in their beauty and clarity. On the concert works Harmonie plays impeccably. The recording is superb; you can hear the inner workings of the scores unlike just about any other account. They have joy and fire- a willingness to go all out. All said, this is a superior disc – beautifully recorded, well-played, attractively produced.